Kickle Cubicle is an action-puzzler that was first released in the Arcades in 1988. Your quest is to rescue the Fantasy Kingdom residents and restore the four palaces that have been hidden by the Wicked Wizard King. 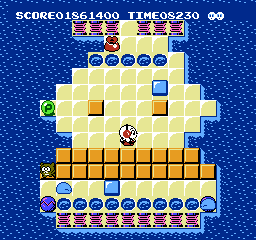 Each level is timed and tasks you with collecting all the Dream Bags by freezing enemies, pushing ice blocks to make platforms, and using pillars that act as defensive barriers. Garden Land and Fruit Land do a great job of easing you into the action and there's tons of clever ideas to test your mental agility, such as deploying ice pillars to deflect cannon balls while slowly circling to collect Dream Bags. There's also some great moments where you bounce frozen enemies off hammers to make platforms in different areas of the screen. It simply never rests on its laurels and continually throws new enemy types, hazards and gameplay mechanics at the player. Cake Land ups-the-ante by introducing Koopa Troopa wannabes that spin around the screen, and spikes that break blocks upon impact. What I love is that some levels revolve around pure action rather than puzzle, such as having to follow a set path while dodging blocks bouncing on springs. Toy Land bundles everything together into some tough puzzles, but thankfully it's never so hard that mere mortals can't beat it! Minor criticisms are that there's perhaps too many levels per world (between 16-17 each) and the four themes don't cater towards their specific names. The bosses are very similar, but it's still enjoyable throwing blocks at them and dodging their attacks. Once you've beaten the game, 30 Special levels are unlocked; the difficulty is sky-high but they provide a good challenge for experts. Kickle Cubicle is an exceptional game that successfully blends action and puzzle elements into a beautifully crafted adventure. Every level is exquisitely designed and the balanced difficulty curve, uber-cute characters and top-notch gameplay make this an irresistible title that every NES owner should experience. Random trivia: In the Japanese version, players could select the order in which they tackled the game's four worlds.